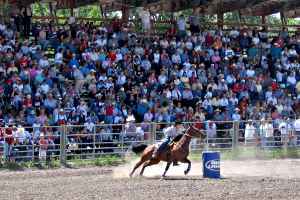 Choteau's little 4th of July rodeo is always a popular event. This year, aside from semi-resident David Letterman, attendees included a family from Augusta, Italy. Although the toning-down of quality necessary for these images wreaked havoc with the crowd in the background, I think you can spot them just over towards the upper middlish left. They're wearing cowboy hats. See them? Oh, and there's Letterman, upper right center about 5 rows down. No hat. Busch Lite in his left hand...no, right hand. Got it?